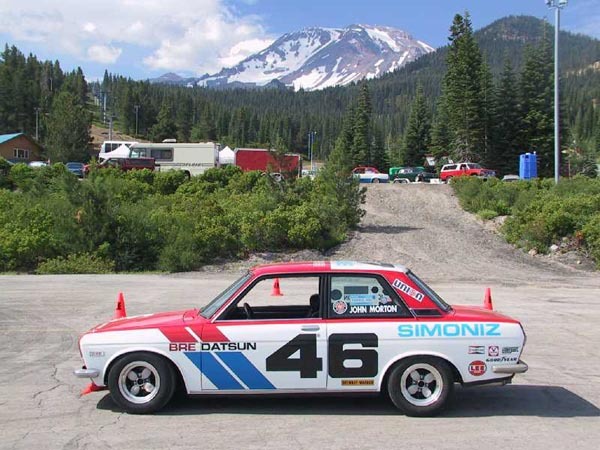 Gunn High School car gathers 6 trophies at this July's "All Datsun Meet" held at Mt Shasta. The All Datsun event attracts quite a large group of Datsun people... even some from Japan! Everyone was wearing T shirts with BRE Datsuns on them so it was really cool having our replica up there. People were flipping out, especially when they found out it was a high school car. Friday was a poker rally and a gymkhana event. We skipped the rally as our car is not street legally registered but Mrs. C. and I entered the gymkhana. Basically I drove while Mrs. C hung through the passenger window armed with a super soaker. The object was to race around a pre determined course and knock empty soda cans off of pedestals with a water blast. Kinda exciting. Mrs. C took a beating though getting tossed within the window frame and has some NASTY bruises to prove it! Believe it or not we actually got a second place trophy for this event! What a surprise. Saturday and Sunday there are autocrosses, an event called the "left coast" where you accelerate to a line and let the car coast to a pre determined mark (without touching the brakes...closest to mark wins) and a big car show. I chaired both autocrosses and designed the courses. Saturday's was a bit more technical than Sunday's to keep the speed down and keep people from driving over edge of the cliff (it's really narrow up there!). I guest drove one of Dennis and Peggy Hale's potential top time of day cars. Mrs. C and and a couple of friends drove the BRE car. The friends were there without a running car since they burned a hole through a piston at Thunderhill. We offered them the ride because Shasta was a long way to tow a dead car to just watch. It was also cool to watch someone else push it around. I had the throttle stick wide open on one run, had trouble with the steering on another (hey it was Dennis' car!). Finally I set fastest raw time but I managed to pop a cone leaving me 3rd overall. Oh well! Mrs. C got a first in class in the BRE with my male guest driver getting 2nd in his class. He missed winning by just .3 seconds. His girl friend didn't quite get the hang of it and plowed through a wall of cones tearing up the front spoiler a bit. I took it off for Sunday's event. Saturday night we found out that we had won the Race Car class in the big car show! We got a BIG round of applause as I went up to accept the award. Sunday I opened the course up a bit to get the speeds up. It was really fun. Our guests had left to go home so it was only me and the missus in the BRE car for this one. Both Mrs. C and I won our respective classes that day. A bunch of people came to watch me throw that little car around. It may feel spooky on the racetrack but it works great in an autocross. People were freaking as I tossed it around. I guess they thought it was all looks. It really is fun to drive and has plenty of power! I wasn't too far off fastest time too...not bad considering street tires vs slicks! All in all a good week. We brought home 5 medals for winning events along with a plaque for best race car. Our friend took home a medal for his 2nd place. Lot's of pictures were taken. I'm sure they will be on streetracing.org.